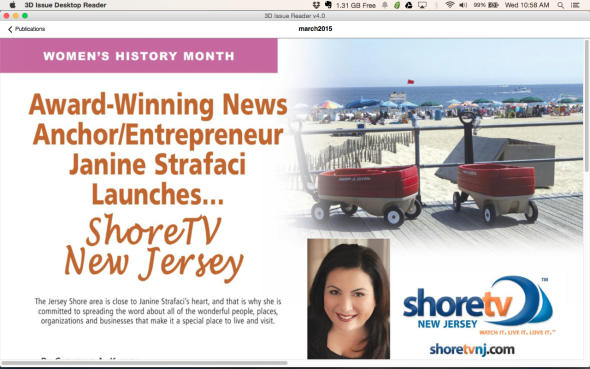 Janine Strafaci and ShoreTVNJ featured in Commerce Magazine! – ShoreTV New Jersey – Watch It, Live It, Love It. Janine Strafaci and ShoreTVNJ featured in Commerce Magazine! ShoreTV New Jersey host Janine Strafaci was recently featured in the March issue of Commerce Magazine! Janine Strafaci was the longest running female news anchor at News 12 New Jersey for more than 16 years, which operated in the number one television market in the country. She is a “Jersey Girl” who has covered her home state for more than two decades.